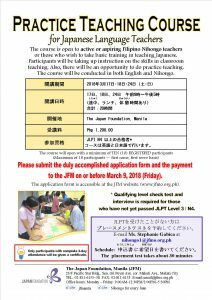 The course is open to active or aspiring Filipino Nihongo teachers or those who wish to take basic training in teaching Japanese. Participants will be taking up instructions on the skills in classroom teaching. Also, there will be an opportunity to do practice teaching. The course will be conducted in both English and Nihongo. 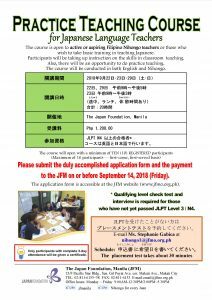 *Applicants are expected to have mastered the Elementary level of Nihongo (JLPT Level 3/N4 or its equivalent). Only participants with complete 3-day attendance will be given a certificate. Please submit the duly accomplished application form and the payment to the JFM on or before September 14, 2018 (Friday). A qualifying level check test and interview is required for those who have not yet passed JLPT Level 3 or N4. Available schedule: Any day between Aug. 28 – Sept. 12 (except weekends) / Any time between 10:00AM – 6:00PM (except lunch time – 12:30-2:00PM). Please write down your preferred schedule in your application form. Please submit the duly accomplished application form and the payment to the JFM on or before March 9, 2018 (Friday). Available schedule: Any day between February 23 – March 8 (except weekends) / Any time between 10:00AM – 6:00PM (except lunch time – 12:30-2:00PM). Please write down your preferred schedule in your application form.